The transition from the 20th to 21st Century brought significant economic changes to Mexico and China. During that period of time, Mexico and China had economies that depended heavily on cheap labor and low currency value manipulated by the government, as well as the shared quest for a higher export rate to the U.S. market. Competition soon sparked between the two countries because of these similarities. They both targeted the U.S. market because of its standing as the largest and most developed economy in the world. Additionally, the high GDP per capita in the U.S. suggested that consumers are more able and willing to pay for products. Furthermore, Mexico and China produce and assemble similar products and hire low-wage workers who have little technical skill. Mexico did possess advantages over China—the lower trade price under terms of the North America Free Trade Agreement (NAFTA) and closer proximity to the United States—but these were seemingly weakened by China’s membership in the World Trade Organization (WTO). When a country has the advantage of cheap labor and low value currency, the business of assembling parts becomes very lucrative as overhead costs are limited. In Mexico, these assembly plants are referred to as maquiladoras. In 2006, maquiladoras contributed $25 billion USD to Mexico’s foreign exchange. Nevertheless, over time, it has been proven that China is winning the competition. Mexico and China have very similar exporting baskets, meaning the two countries ship similar products overseas every year. Since China’s induction to the WTO in 2001, it has surpassed Mexico and has become the second largest exporter to U.S. market. In 2006, China also surpassed Mexico and became the U.S’s second biggest business partner after Canada. With the rise of cheap Chinese products, Mexico has suffered greatly. Mexico is still heavily dependent on the U.S. market, but its share in the U.S. market has decreased. Some argue that China did not take Mexico’s share, but instead created more commerce in the U.S. market as well as the global market. Studies show that Mexico suffered directly from the rise of Chinese industries, most notably since the year China joined the WTO. From 1995 to 2000, after NAFTA was enacted, Mexico’s growing export rate was 15.8 per cent, but the rate decreased by 9.5 per cent to 6.3 from 2000 to 2006 after China’s entry to the WTO. China’s rising industries pose other threats to Mexico’s maquiladoras. For example, in 2002, only a year after China joined the WTO, about two hundred maquiladoras closed in Mexico. Such changes in the Mexican economy will inevitably hurt Mexican employment rates. Statistics from the Instituto Nacional de Estadistica, Geografia e Informatica show that in 2002, 3,288 maquiladoras employed over one million workers. Mexico cannot afford the loss of jobs should these maquiladoras shut down. Although Mexico and China both produced low value-added goods, which rendered low profits, China’s growth rate in this sector grew faster than Mexico due to its inclusion in the WTO. Before China joined the WTO, it is important to note that China’s exports were increasing more rapidly than those of Mexico. For example, from 1996 to 2000, Mexico exported 1.11 percent of the world’s leather, and at the same time China exported 1.99 percent. However, four years later, China was shipping out 7.34 percent of the world’s leather, while Mexico exported only 2.49 percent. Moreover, over the same time period in areas such as the exportation of heating and cooling equipment, Mexico led China with a market share of 2.04 percent as opposed to Beijing’s 0.79 percent. However, China quickly increased its exports to 5.31 percent within the span of just 4 years, leaving Mexico with only a 0.15 percent advantage. This means that even though Mexico had a head start with the signing of NAFTA, it was not difficult to predict that China would not only catch up, but also surpass Mexico at an astonishing rate. In the battle of exportation with China, Mexico lost both profit and market share. However, the one industry that recovered the fastest after the 2008 financial crisis and remained steady after 2001 was the autoparts-automobile sector. The majority output of the autoparts-automobile industry in Mexico goes to exportation, and overtime the industry gained importance in Mexico’s foreign trade. In 2010, the industry composed 28 percent of Mexico’s exports and 17 percent of its imports and represented the largest trade surplus in the Mexican economy. Although China may have overcome Mexico in other manufacturing industries, it seemed that Mexico had maintained its comparative advantage in the autoparts-automobile industry. In 1990, before the signing of NAFTA, Mexico represented eight percent of exports of the U.S. automobile trade. Five years later, when NAFTA went into effect, Mexico held a market share of 14.96 percent. During the same period, however, China’s exports of auto parts and automobiles in the United States went from 0.11 percent to 0.52 percent. Unlike other exporting sectors in which Mexico took a downturn, the market for autoparts-automobiles has remained strong in the United States. As a result of NAFTA, Mexico has benefitted from low tariffs on exports to the United States, and by 2010, Mexico represented 21.32 percent of auto parts and automobile exports to the United States. At this point, Mexico remained the third largest autoparts-automobile exporter to the United States, after Japan and Canada. It would be easy to assert that Mexico has dominated China in the autoparts-automobile sector. In 2010, China represented only 3.13 percent of U.S. automobile imports, but if one simply looks at two other factors, one will find that China’s autoparts-automobile industry has become more competitive than Mexico’s. First of all, under NAFTA, Mexico was paying a tariff that was only slightly higher than what Canada was paying in 2010. At the same time, China paid tariffs 38 times that of Mexico. Secondly, while Mexico’s market share grew from 8 percent to 21 percent within two decades, growth rate of 11 percent, China expanded by nearly 25 percent. Therefore, China’s competitiveness in the autoparts-automobile industry is not low; it is catching up to Mexico just as it is in other industries. In 2014, China was able to surpass Canada to become the second largest exporter of automotive parts to the United States after Mexico. Mexico should be concerned about China’s growth in the automobile industry because it has become a vital part of the country’s economy. Should China be granted a lower tariff agreement, Mexico’s already sluggish economy will further suffer. The rivalry between Mexico and China in the U.S. market went on for more than a decade, but in today’s highly integrated world economy, it would be impractical to imagine that these two important players will remain opponents indefinitely. Greater cooperation between Mexico and China is foreseeable due to the massive amount of infrastructure investment China has been making in Latin America. Mexican President Enrique Peña Nieto (2012 – present) is further investing in infrastructure development because while Mexico may be the 14th largest economy in the world, its infrastructure ranks 64th. In order to develop its infrastructure nationwide, a country must rely on its revenue, but also attract foreign investments. For Mexico, China is seen as an ideal partner for infrastructure investment because of its commendable record of domestic and international infrastructural programs. With China’s rapid economic growth within the past few decades, the country is constantly investing and developing infrastructure. A 2009 report by the Asian Development Bank (ADB) concluded that from 2010 to 2020 China would invest $8 trillion USD domestically, of which 68 percent will be for new development projects. However, China is not only heavily invested in its homeland, it is also deeply involved in such development in Latin America, Africa, and the Middle East. In November 2014, China, Brazil, and Peru reportedly signed a memorandum of understanding during the Asia-Pacific Economic Cooperation Forum (APEC) that details the construction of a railway that will connect the Pacific and Atlantic Ocean, a distance of 3,500 kilometers. In December 2014, China signed contract to build a $40 billion USD canal across Nicaragua. The number of China-funded infrastructure projects in Latin America has been consistently rising. Although a fair number of Mexico’s maquiladoras were shut down because of their being persistently noncompetitive with Chinese assembly plants, China is now in the position to bring in foreign funds and invest in Mexico’s industrialization process. 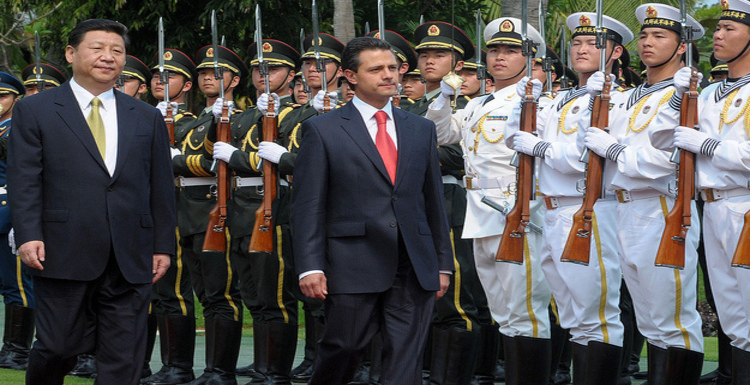 In June 2013, Chinese President Xi Jinping visited Mexico after traveling to Central America and the Caribbean where billions of dollars of loans were pledged. The trip was intended to smooth relations between the two countries, and it has certainly done so. During Xi’s visit, the two countries announced a series of agreements on energy, trade, and education to fuel China’s ongoing competition with the United States in the international market. President Peña Nieto said China sought to aid the Mexican economy by promising to import more pork and tequila. As more trade and investment agreements are being made, Mexico and China are changing from competitors to partners in multiple sectors. The “Investment Climate Statement” published by the Department of State in 2013, states that Mexico has a relatively open market for foreign investment in which 95 percent of businesses do not need government approval before opening. Also, the report suggests that Mexico has successfully made the process of starting a new business less difficult. However, despite Mexico’s relatively open market, there are still a few sectors that are tightly controlled by the government. For example, the energy and telecommunication sector only allow for restricted access. Within the energy sector, the oil industry remain strictly controlled by the state. At the same time, the telecommunications sector only allows up to 49 percent of foreign control. Further reforms have been made to attract foreign direct investment (FDI). More specifically, the new Public-Private Partnership (PPP), enacted in 2012, has attempted to create a more efficient legal framework. The PPP law also makes the bidding process in Mexico more competitive, efficient, and transparent. On the other hand, updated laws do not guarantee protection for foreign businesses. Many steps need to be taken before Mexico can become an ideal destination for foreign investors. Because of Mexico’s rampant corruption, foreign businesses that decide to invest in Mexico face the challenges of local governmental venality, as well as the issue of transparency. In fact, a major railway project fueled by Chinese investment was cancelled because of a corruption scandal that was connected to Mexico’s current president. Just when Mexico and China seemed to be building a promising relationship, Mexico surprised China with the cancellation of a China-led bid for a bullet train project. Mexico’s cancellation, right before President Peña Nieto’s scheduled visit to China for the APEC, created tension between the two countries. The railroad project was worth $3.7 billion USD, and it would have run 130 miles from Mexico City to Querétaro. The project was cancelled because one of the four Mexico companies bidding with the state-owned China Railway Construction Corporation (CRCC) was allegedly involved in corruption scandal tied to the President. The state-owned China Railway Construction Corporation (CRCC) and four other Mexican companies led the bid. After the cancellation, China stated that it was shocked by such a decision as it had complied with Mexico’s bidding requirements throughout the project, stating that this was Mexico’s domestic affair in which China was not involved. In January, only months after the cancellation of the railway project, President Peña Nieto pulled the plug on yet another Chinese-invested project. The Dragon Mart Mall was scheduled to be built south of Cancún where a growing number of Chinese tourists have started to visit. This multimillion dollar project was put on hold, after commencing in 2013, because it has severely damaged sensitive beaches and plantations in the area. This resulted in a ruling in which the Mexico’s Environmental Protection Agency issued a $1.5 million USD fine against the Dragon Mart Mall developer. This project would have been the second largest venue for Chinese shoppers outside of China. The developer failed to obtain a permit from the local government at the beginning of the project, but after a series of appeals and legal processes, the project obtained a permit and construction resumed. In conclusion, it is obvious that Mexico and China have had difficulties within their relations, but the general trend suggests that Chinese investment in Mexico will continue to grow. China is now Mexico’s second largest trading partner, and more cooperation seems likely judging by the trade promises made by each country’s President. Despite two failed investments, China Telecommunications Corporation, the parent of China’s third-largest carrier, is searching for potential investment projects in Mexico. Even though China was shocked by Mexico’s decision to cancel major Chinese-funded projects, and although it caused temporary tension between the two countries, it apparently will not affect future plans China may have for investing in Mexico. Moreover, China’s presence in Latin America is increasing, and is a popular topic frequently discussed by scholars and specialists. With China’s rapid economic development, its need for natural resources is insatiable. Latin America’s vast amount of resources, as well as its shared position with China on imperialism, make it a region ripe for Chinese investment. For two decades, Mexico and China have competed for shares of the U.S. market. In short, competition between the two countries has become somewhat less intense due to Mexico’s need for foreign investment in infrastructure projects, allowing China to invest and develop in Mexico just as it is in the rest of the region. A mutually beneficial relationship now seems to be in the making. Anthony Harrup, “Mexican Government Boosts Infrastructure Investment Plan,” Wall Street Journal, published April 28,2014, http://www.wsj.com/articles/SB10001424052702304163604579530131171053254. “The Asian Infrastructure Investment Bank,” The Economist, published March 21, 2015, http://www.economist.com/news/asia/21646740-development-finance-helps-china-win-friends-and-influence-american-allies-infrastructure-gap. “China Expands Infrastructure Project in Latin America,” China-US Focus, published December 9, 2014, http://www.chinausfocus.com/finance-economy/china-expands-infrastructure-projects-in-latin-america/. Elisabeth Malkin, “Xi makes Brige-Building Trip to Mexico,” The New York Times, published June 4, 2013, http://www.nytimes.com/2013/06/05/world/americas/xi-makes-bridge-building-trip-to-mexico.html?_r=0. Vicente Corta Fernadez, et. al., Open for Investment: How Mexico is Paving the Way for Infrastructure Investors (New York: White & Case, LLP., 2014). Austin Ramzy, “Dismay From China After Mexico Cancels High-Speed Rail Bid,” The New York Times, published November 10, 2014, http://sinosphere.blogs.nytimes.com/2014/11/10/dismay-from-china-after-mexico-cancels-high-speed-rail-bid/. Cecilia Sanchez, “Mexico halts Chinese mega-mall project after damage to environment,” LA Times, published January 28, 2015, http://www.latimes.com/world/mexico-americas/la-fg-mexico-closing-chinese-megamall-20150128-story.html. “CORRECTED – China Telecom parent studying Mexico investment – spokesman,” Reuters, published January 19, 2015, http://www.reuters.com/article/2015/01/19/mexico-china-telecommunications-idUSL1N0UW0EA20150119.